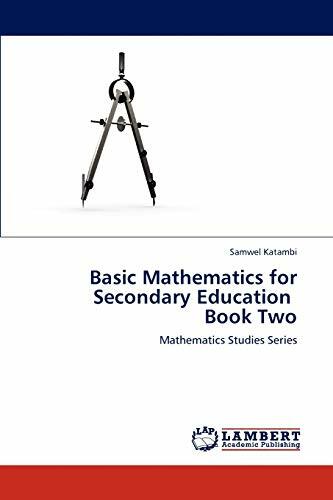 This mathematics book is the second of the series of Mathematics Studies books from Samwel Katambi, the author of the Basic Mathematics for Secondary School - Book One. It includes mathematics concepts such as Exponents, Radicals, Algebra, Congruence, Similarity, Trigonometry, Pythagoras Theorem, Sets and Statistics. It is suitable for those learners and readers who take mathematics subjects in schools and colleges. The topics are arranged in engaging manners which enable the reader to understand the concepts easily. This book will help anybody to realize his/her mathematics potential as he/she progress to higher education and career. Samwel Katambi is a Programmer, Computer System Analyst and Mathematicians who have written a series of mathematics books known as Secondary Education Mathematics. Graduated at the University of Dar es Salaam where he took Computer Science majoring in Mathematics, the 30 years old scholar like to share his academic knowledge with others worldwide.